Jonny Evans says Northern Ireland had to regain their composure when Belarus equalised in their Euro 2020 qualifier. Evans headed his side into a deserved lead on the half hour but Belarus drew level three minutes later to dampen the atmosphere at a heaving Windsor Park. Josh Magennis grabbed a late winner to send NI clear at the top of Group C with two wins from two. "I think it knocked us a bit because we know how hard it is to score," said Evans of the Belarusian equaliser. The Leicester defender told Sky Sports: "After getting the goal you think you have a nice little cushion and then they got the goal back more or less straightaway and I think it knocked us for a while. "But we kept on going, it probably wasn't our best performance, but I thought we controlled the game in many ways." Evans finished off a well-worked corner routine to put the home side in control on a rainy night in Belfast but their lead lasted just three minutes before Igor Stasevich's speculative shot took a wicked deflection that looped over Bailey Peacock-Farrell in the Northern Ireland goal. The home side renewed their assault on the Belarusian goal after the restart but they had to bide their time before Magennis struck with just minutes remaining. "I wouldn't say we were patient, it didn't feel like we were being patient," added Evans. "But we got the goal at the end and Josh has come off the bench and tucked it away, which was a great feeling for us." 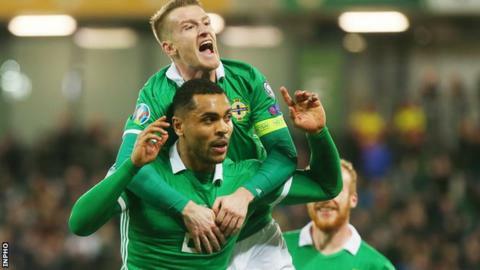 Magennis was introduced in the 68th minute by manager Michael O'Neill and the striker played a key role in the build up to his fifth international goal, winning possession on the edge of the area before timing his run to meet Paddy McNair's low cross on the edge of the six-yard box. "There's no better feeling than scoring a goal for your country, especially at home at Windsor Park it's absolutely fantastic and everyone goes nuts," said the Bolton forward, who was pleased to be able to repay the manager's faith in him. Magennis continued: "Michael asks that of players who come off the bench to try and make an impact and I'm just blessed that it was me." "Michael puts demands on us to not just be a direct team, we try and play at times and we might not have been at our best but Michael said all along that we're a team that finds a way of winning, whether that's going long or with patterns of play. "The squad is really developing and some of the lads coming in, such as Jordan Jones and Gavin Whyte, who's missing through injury, and the senior lads like Jonny keeping us steady at the back so we've got a great mix." The 100% start leaves Northern Ireland well positioned ahead of their next qualifiers in June when they will travel for their return matches against Estonia and Belarus before then going up against Germany in September and top seeds the Netherlands in October. "Between Estonia and Belarus, we want to try and top that mini group. We've got tough fixtures coming in September, October and November," said Evans. "Leading up to that we've got two away games against the two teams we've just played against in June, which are going to be tough fixtures, so it feels like we're only half-way through that little mini group at the minute but six points - you can't ask for anything more."